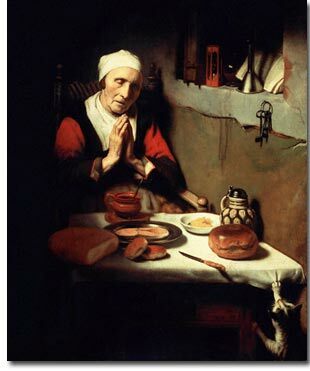 Another great Dutch painter was Nicolaas Maes (1632-1693), who came to Rembrandt a few years after the master had settled in Amsterdam, and who marked himself by the independent manner in which, after assimilating his master's principles, he applied Rembrandt's instruction and example. While the portraits which he executed in his later years are excellent, he shows himself at his best in his earlier work, soon after he left Rembrandt. In the work of this period be unites subtlety of chiaroscuro, vigorous colour, and great mastery in handling, with that true finish which never becomes trivial. The figures are finely drawn, and their action is perfect. Harmonies of red and black prevail, sometimes pervading the picture in subdued tone, sometimes brought out in full contrasting force against white. In his last years he painted a number of children's portraits for the patrician families of his time, but succumbed somewhat to the Frenchified taste which was then sapping Dutch character.